It may surprise you, but when I think of the holidays, I think of Christmas breakfast first. Maybe because it’s the one meal of the day you can get away with a sweet treat for breakfast or maybe because it’ll help you start your day off right. Either way, Christmas morning with my family starts early, setting you up for a long day of family, fun, and eating! Our holiday breakfast is typically comprised of breakfast casserole, monkey bread, and ambrosia. 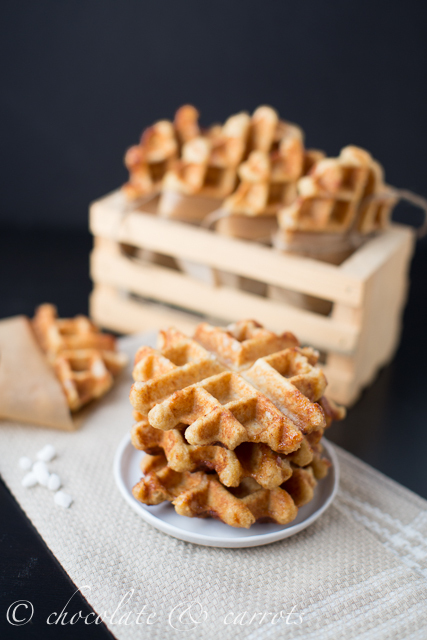 But, how fun would it be to change things up a bit and serve a whole grain version of Belgium’s famous liege waffles? Being as they are absolutely incredible and basically have the syrup built in the waffle (thank you pearl sugar! ), they are perfect for eating on the go! Simply wrap them up in some parchment paper and you’ve got a delightfully sweet and holiday whole grain breakfast at your finger tips (pun intended)! The beautiful thing about these waffles is the pearl sugar. You can usually find Belgian pearl sugar at natural food stores, specialty stores like World Market, or online at Amazon. 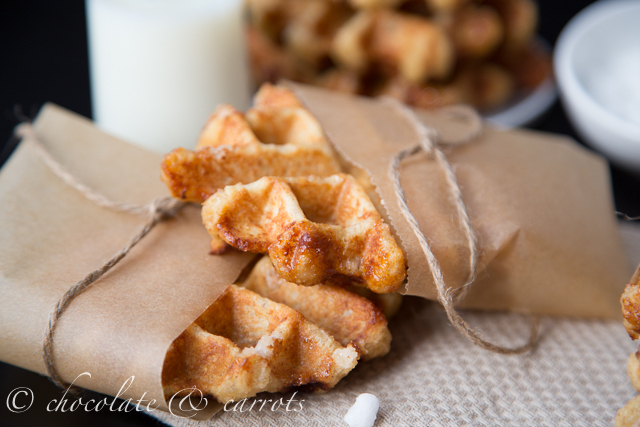 The sugar throughout the yeasted dough caramelizes into these scrumptious pockets of sweet throughout the warm waffle. 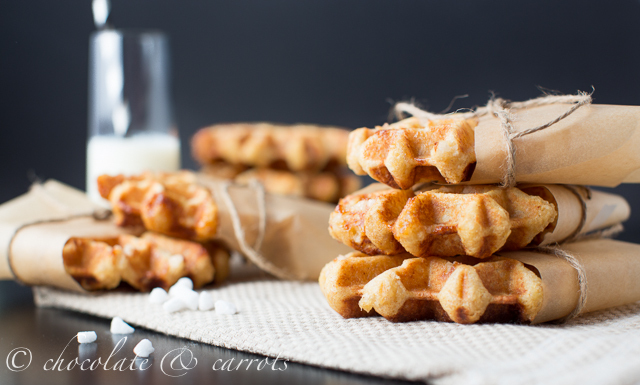 Despite the waffles being made with whole wheat flour, they have a lovely soft, crunchy, chewy, and doughy texture. All perfect waffle types rolled into one! Three cheers for whole grains! And how cute is my little helper? He wanted to help himself to a waffle, but instead I told Liam to smile for the camera to show you our photo setup today! Coincidentally, it seems to be waffle day too! 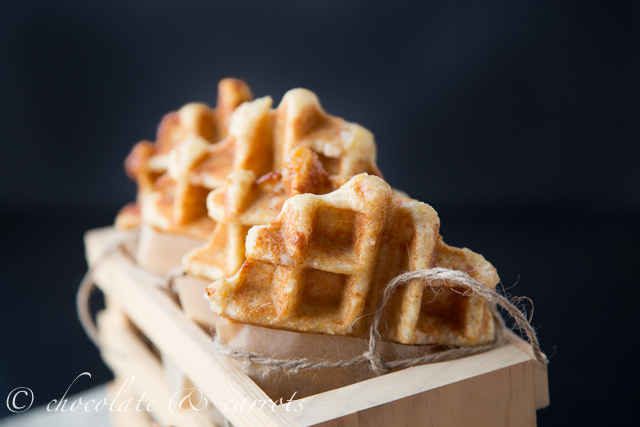 My friend, Darla, at Bakingdom is also sharing a scrumptious liege waffle today. 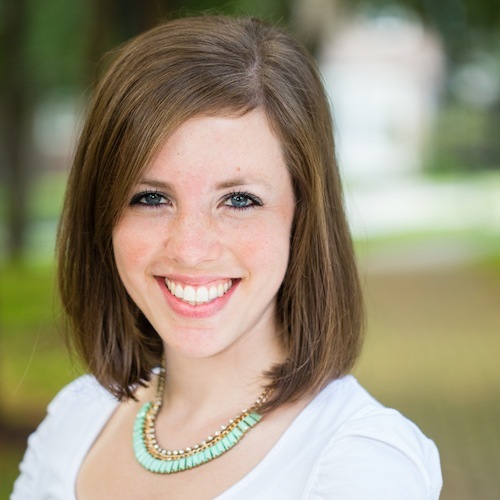 Be sure to go check out her Gingerbread Liege Waffles! Now for the part you’ve been waiting for (besides me whipping up a batch and mailing these waffles to you)! Prize: $25 worth of assorted Hodgson Mill products! To Enter (Mandatory): What is your favorite cookie for the holidays? Like chocolate & carrots on facebook. Follow chocolate & carrots on twitter. Follow chocolate & carrots on instagram. Follow chocolate & carrots on pinterest. Notes: Hodgson Mill is offering $1 off any 5 lb. bag of flour and a chance to enter the Hodgson Mill’s Baker’s Holiday Gift Pack Sweepstakes. Mix the yeast, sugar, and water together. Let sit for 15 minutes to proof. In the bowl of your stand mixer, combine the salt and flours together. Pour the proofed yeast into the center of your stand mixer and mix on medium speed until combined. Slowly add in the butter until incorporated. Add in the vanilla and cinnamon until combined. At this point the dough is very wet and that’s how it should be. Cover with plastic wrap and let it rise until doubled in size (about 1.5-2 hours) in a warm, draft free place. Gently fold in the pearl sugar. Cover and let rest for another 15 minutes. Meanwhile, heat up your belgian waffle iron. Scoop a 2″ ball into the center of your waffle iron. With the waffle iron on the 3-4 level setting on your waffle maker (which took my waffles 2 minutes to cook), allow the waffles to cook until they are golden brown. Allow the waffles to cool for about 1 minute before serving warm! No purchase necessary to enter. Prizes will only be shipped within the United States. Winner will be selected at random by chocolate & carrots using Random.org. All entries received after the giveaway closing day and time will not be considered. Entries that do not follow the entry requirements will not be considered. Winners will be notified via email and will have 24 hours to confirm receipt of the email. 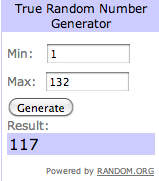 If the winners do not reply within 24 hours, another winner(s) will be selected. Giveaways will be mailed to the winners’ address. This giveaway has been sponsored by Hodgson Mill. I received an assortment of Hodgson Mill flours as compensation. All opinions stated are my own. I don’t know if they count as cookies, but my mom makes peanut butter balls every year during Christmas (some people call them Buckeyes). I LOVE them!! My favorite holiday cookie always changes, but I’m a little obsessed with my Peppermint Mocha right now, so fudgy and delicious! Those waffles are gorgeous! I loveee waffles. I don’t pull out my maker enough. And your little helper? SO cute! My favorite holiday cookie- sugar! My favorite holiday cookies are the homemade decorated santa cookies my family makes using my great great grandmothers cookie cutter. Delicious and so cute! Waffles are becoming regular in my kitchen every weekend now. I have never heard of pearl sugar but any kind of sugar sounds good to me. I am going to look more into it. My favorite holiday cookies are decorated sugar cookies! My fav. cookie for the holiday is anything with chocolate & mint. I follow you on twitter. Those waffles look delish. One of my favorite holiday cookies is an oatmeal cranberry orange white chocolate chip cookie. It’s so delicious. Favorite cookie – it is a tie between chocolate chip and Italian rainbow. I already like C & C on facebook. My favorite cookie is whole wheat chocolate chip. I love it for any time of the year. My fave cookie would be oatmeal chocolate chip. My favorite cookie for the holidays are spritz cookies. And rum balls! haha! I love any peppermint chocolate cookies during the holidays! My favorite cookie for the holidays is gingerbread! My favorite holiday cookies are sugar cookie cutouts and brandy snaps. I like Chocolate and Carrots on Facebook. I make a little bar that is made with eggnog it is like a cheesecake but it is not cheesecake. 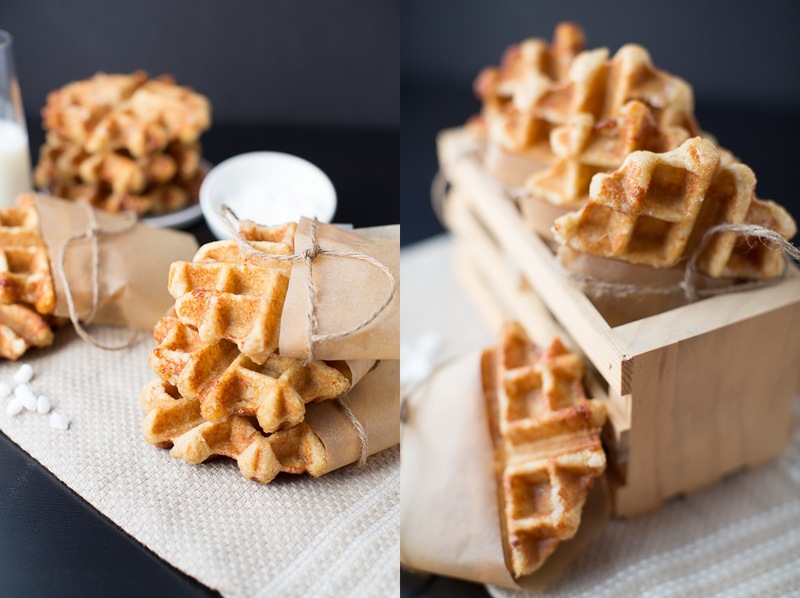 Beautiful waffles + pretty styling! My favorite Christmas cookies will always be my mom’s Covered Cherry Cookies. Chocolate cookies with a cherry in the middle covered in chocolate ganache. Until I tried to make them I never realized how labor intensive they were… but so worth it! Oh my gosh. Love Liege waffles! SO so so good. And love that you got the pearl sugar for these. They must be delicious! My favorite cookie is chocolate chip. It doesn’t change around the holidays! My favorite holiday cookie is a snickerdoodle! My favorite Christmas cookie are melting moments, at least that’s what my mom calls them 🙂 I think they’re also called Mexican wedding cookies. I just love all that powdered sugar and a buttery cookie! Potato Chip Cookies are my fave! And that pearl sugar, I’ve heard of it and that it makes waffles fantastic. Beautiful photos too. I love my grandma’s peanut butter cookies. I love decorated sugar cookies for Christmas! Love the set up, that is what mine usually looks like as well. I love when my mom makes apricot horns, becuase it is sweet and so amazing with the powdered sugar sprinkled on top. To die for!!!! Just pinned this amazing waffle recipe! Oh my gosh, waffles. I am so hungry now! We make tons of pizzelles every year for the holidays, so I really love them. I like chocolate dipped shortbread cookies. Snowballs. Butter, pecans, confectioner sugar…mmmmm. I love all cookies but my favorite would have to be chocolate chip. My favorite cookie for the holidays are decorated sugar cookies…they are a tradition and always so tasty! My favorite holiday cookie is my grandmother’s cream cookies. I really love checkerboard cookies because they hold memories for me! Thanks for the giveaway! I love decorating holiday sugar cookies! Love, love, love Liege waffles! My favorite holiday cookie is the classic frosted cutout! My favorite cookie is almond crescents, dipped in dark chocolate.